I am excited to announce a new section of my blog, today. As many of you know, my husband is a butcher. He is actually the third generation of butchers in his family. They have owned their own old-fashioned meat market for almost 50 years. He has agreed to give tidbits of advice, clarification, explanation, etc. of meat, BBQ, and best practices and money saving tips. I thought adding a section like this would be very helpful to a lot of my friends and family. I am constantly asking him to explain it to me, so why not share the knowledge? **Marbling is best described as the fat which is within the meat, not the fat surrounding the meat. If you are trying to get the most "bang for your buck", CHOICE is a good route to go. The amount of marbling is determined by the amount of time spent in the feed lot. Cattle with a grade of Prime spend more time in the feed lot than Choice or Select (hence the reason they have more fat/marbling). The amount of time in the feed lot plus the type of feed (fed to the cattle) determines the amount of fat and marbling in the meat. This is a basic and simple description (breed, genetics, and feed can slightly alter the above information). Markets (and grocery stores) with full service counters will offer the higher end cuts of beef, Prime and Choice Grade. 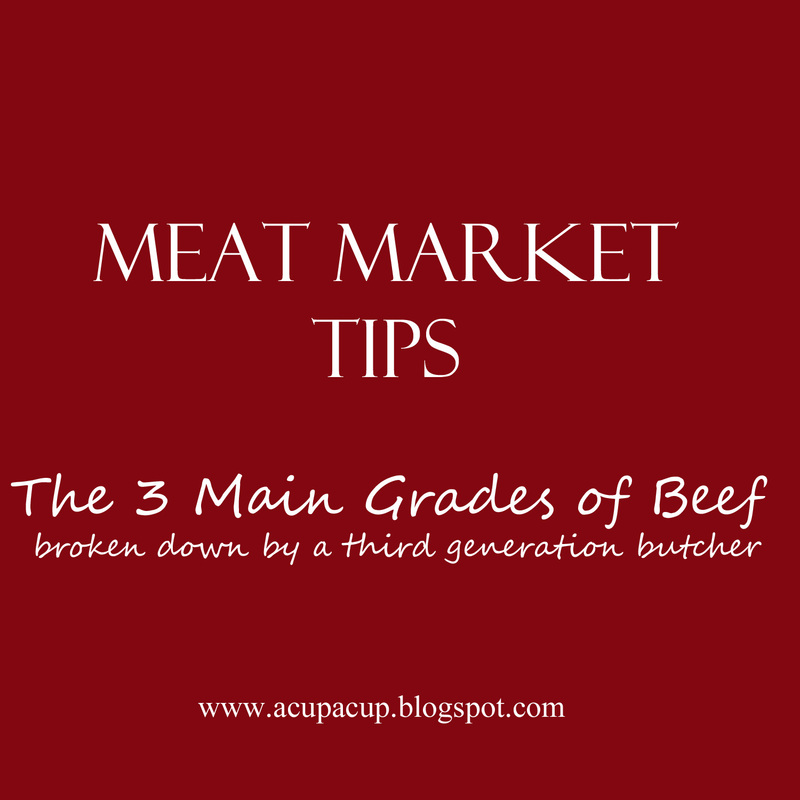 Most beef that is pre-packaged and not fresh out of the counter will most often be Select Grade. I hope this section is beneficial to the "meat buyer" :) in your family. 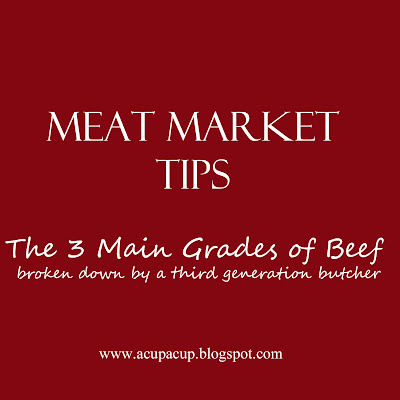 It will always contain basic information that can be used at a meat market or grocery store (meat counter). Leave me your feedback, I would love to know if you found this new section helpful. Yes! This is very helpful, and I can't wait to see what else you and Charlie will share in this new blog section!